Great news for data enthusiasts (otherwise known as nerds): data blending features are now in Data Studio! Data blending, as the name suggests allows you to combine data from multiple data sources in Data Studio. This can be handy for a few things, for example, cross-platform reporting. If you’re running ads in Bing, you might be measuring conversions via Google Analytics instead of the Bing UET tag. In this case, to view conversion data you can blend Bing Ads click data with Google Analytics Bing Ads revenue. That way you can easily visualise and analyse it. Data Studio’s data blending now allows you to do this within their UI, without resorting to a Google sheets workaround. In this blog, we’ll show you how to do that. Before we get started, one important thing you need in order to blend data is a join key. A join key is a dimension that is shared by the data sets you are trying to blend. A simple example of this can be a date or landing page, basically any dimension that exists on both data sets. How do we blend data in Data Studio? There are multiple ways to blend data in Data Studio. 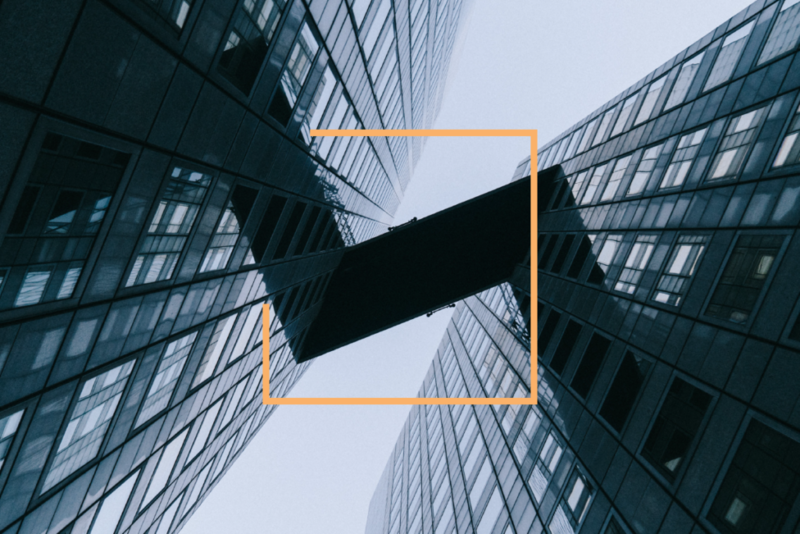 One way is using the Manage blended data feature under Resource or Blend data from existing visualisations through the right panel. 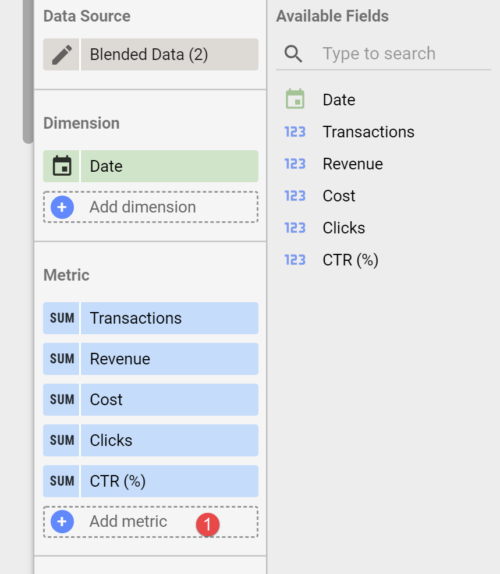 In this example, I will focus on accessing the data blending feature from the left panel where I will blend Bing Ads and Google Analytics data. The first thing you want to do before anything else is to connect the relevant data sources to your report in Data Studio. Once you connect a data source to your report and draw a visualisation, you will see the data source listed on the right panel alongside all metrics and dimensions. 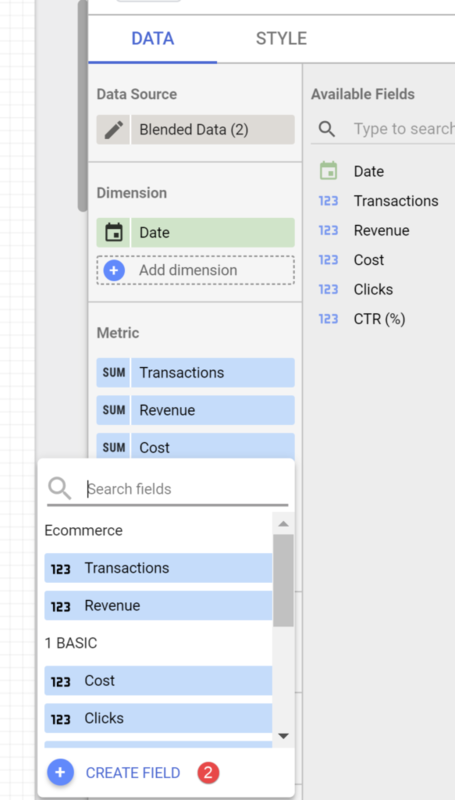 In my example below, I have connected a Bing data source using Supermetrics and drawn a table with date dimensions and metrics (impressions, clicks and CTR). The timeframe I am using is for the last 30 days. The next step is to then blend the data with a different data source. In our case we will use Google Analytics data. To blend the data, click on the blend data button under the data source on the right panel. From there you need to choose your data source (Google Analytics). Now, because I am blending Google Analytics data to Bing Ads data, I have added a filter on my Google Analytics data. The filter limits the data and makes sure that the data being pulled has the source/medium of ‘bing/cpc’. Once you save the blended data report, the two different data sources will be merged to one report. The red metrics are from Bing Ads whilst the green are from Google Analytics. The data blending feature saves a lot of time. The filter addition is helpful as it allows you to map subsections of data together. You can also create custom metrics using Datastudio’s calculated metrics. To do this, click on the Add metric button within the blended data chart then click create field. Once you click create field data studio will prompt you to add the calculated metric you want. 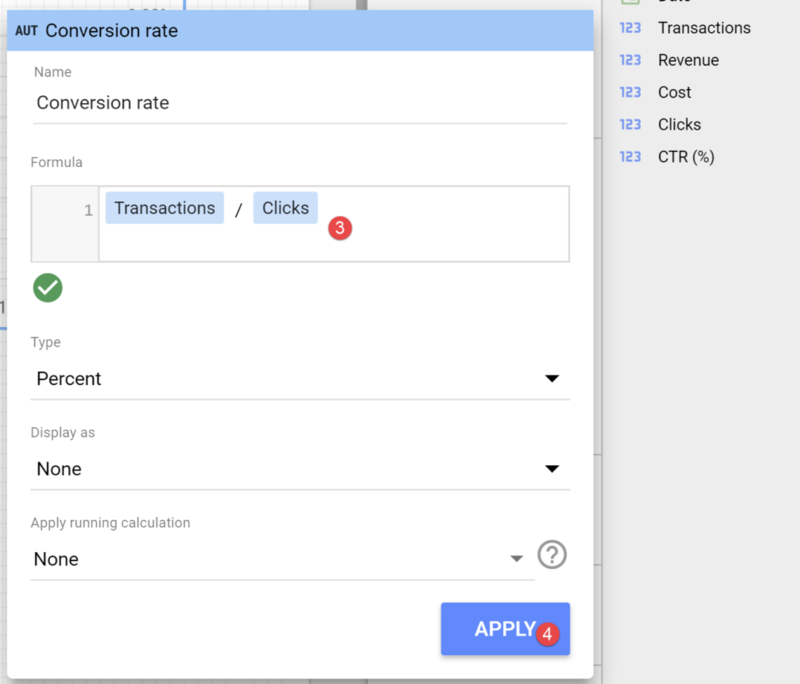 In this case we might want to create a conversion rate metric so we just need to enter Trasactions / Clicks and Datastudio uses the blended data to calculate the conversion rate. The data blending feature is great, very neatly done by the Data Studio team and a huge time saver.